My dad's favorite sweet treat. Don't be afraid, the bitterness of the orange peels gets blanched right out before they even get candied and chocolate covered. These take forever. They do. There's no way around it. There's several steps and each one is somewhat involved. Honestly, the worst part is laying the peels out on the drying rack after being candied so that none are touching each other. If you skip this step you'll end up with tangled glob of sticky citrus peel that will be un-dippable. However, if you have an afternoon (and most of the night as well) to kill, these are worth making. People rave about them. 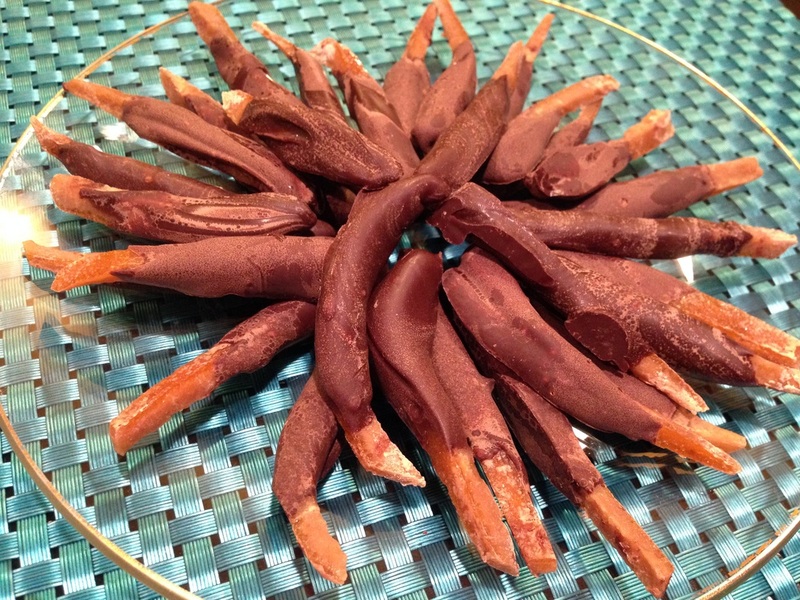 They're exciting because they're unlike the tired and over-done chocolate dipped pretzels. These are unique and make citrus peel edible! I've tried making candied and chocolate dipped grapefruit, lemon and lime peels. The only citrus peels that really didn't work at all for me was the lime. The orange peels are the best but lemon and grapefruit peels can certainly work in this recipe. 1. I used raw cane sugar instead of generic refined sugar. It's usually light brown in color and has a syrupy, molasses-like flavor in addition to sugar's normally one dimensional sweetness. I use a 1 to 1 ratio when replacing refined sugar with raw cane sugar. 2. I dip mine in dark chocolate, cause why would anybody not? Melt your favorite dark chocolate over the stove. Dip you're candied and dried peels in it. Lay out on wax paper to dry for a few hours.